Earn 3% Commissions - By joining LuckyReferrals.com and referring customers to LuckyGunner.com, you'll earn money from whatever they buy. We want to pay you to help our business grow! 90 Day Cookies - Earn more money longer as you earn commissions for up to 90 days after the initial referral. Earn Bonus Commissions - If you generate more than $100 per month in commissions, you will retroactively be bumped up to a 4% commission rate on those previously generated commissions for that month plus any future commissions you generate during the same month. Recruit Sub-Affiliates - Refer new affiliates to LuckyReferrals.com and earn an additional 1% commission on all of the sales your sub-affiliates generate. Wide Product Variety - LuckyGunner.com carries ammunition and reloading supplies - all with no back-orders ever. Happy Customers - LuckyGunner.com strives to provide outstanding customer support and good deals on everything we've got in stock. Send us your referrals and we'll do our best to make them happy! Fast Payments - Just like LuckyGunner.com's fast shipping policy, LuckyReferrals.com pays our affiliates fast - 15 days after the close of every month! Transparent Click-Tracking - You'll be able to independently test and verify your affiliate referral links, ensuring that you get paid for every referral you send to LuckyGunner.com. Easy-to-follow instructions on how to do so are located inside our affiliate area once you're registered & logged in. Who Can Make Money With LuckyGunner.com? Gun & Survival Forum Owners - Advertise LuckyGunner.com and offset the cost of running your forum. 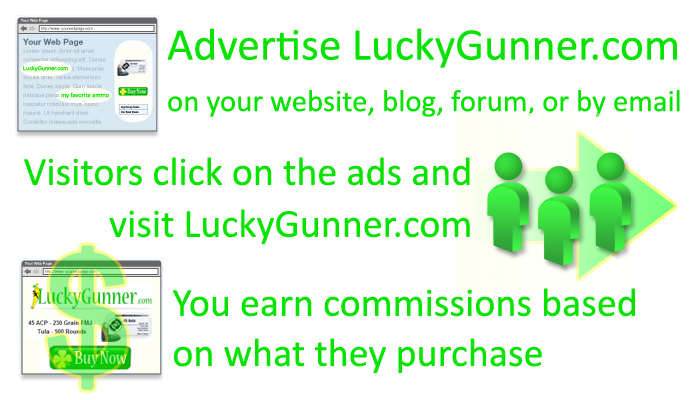 Gun & Survival Bloggers - Promote LuckyGunner.com to your readers and make more money writing about what you love. Gun & Survival Training Centers - Offer LuckyGunner.com as a trusted source for your student's training materials - and earn a percentage of every order they make. Podcasters - Tell your listeners about LuckyGunner.com and give them a special link on your podcast site which they can click to support you. Sign up to advertise LuckyGunner.com by joining the LuckyReferrals.com affiliate referral platform. Once you've joined LuckyReferrals.com, log-in and pick out the banner or text link(s) for LuckyGunner.com that work best for you and your site. Put the banner and/or text links in prominent locations on your web site to ensure visitors click on them. When a visitor clicks on one of your banners or links, that visitor is tagged as a referral from you via a standard web cookie. You're paid a percentage of the sales price based on what that visitor purchases when they visit LuckyGunner.com. The amount you're owed continues to accumulate until your referral payment is issued. Payments are issued 15 days after the close of every month via PayPal and you can log into LuckyReferrals.com at any time to see what's currently owed to you. That's it! We'll pay you for the business you refer to us! All participants must have a PayPal account in order to receive payouts. Don't worry, we use PayPal Mass Pay so you don't pay any fees for receiving funds from us. All participants may NOT post affiliate links in places such as CraigsList which purposely state the incorrect price of our products. Participants who violate or circumvent these rules will have all affiliate referral credits voided and will not receive payouts. Additionally, they will be banned from further participation in the LuckyReferrals.com affiliate referral program for LuckyGunner.com. Signing up and getting your LuckyReferrals.com account configured couldn't be easier. Just click the button below to get started by filling out your account application. You'll be referring your friends and website visitors to LuckyGunner.com in as little as five minutes!